In this remarkably human portrait of one of the twentieth century's most complicated personalities, Mohammad Reza Pahlavi, Andrew Scott Cooper traces the Shah's life from childhood through his ascension to the throne in 1941. He draws the turbulence of the post-war era during which the Shah survived assassination attempts and coup plots to build a modern, pro-Western state and launch Iran onto the world stage as one of the world's top five powers. Readers get the story of the Shah's political career alongside the story of his courtship and marriage to Farah Diba, who became a power in her own right, the beloved family they created, and an exclusive look at life inside the palace during the Iranian Revolution. 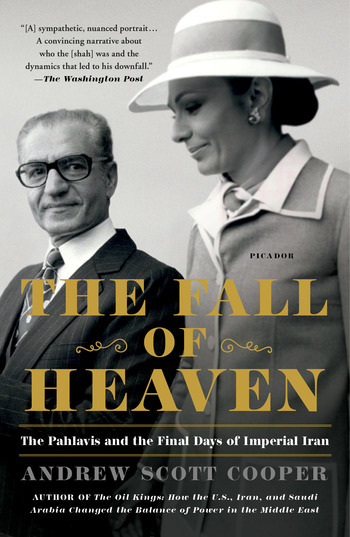 Cooper's investigative account ultimately delivers the fall of the Pahlavi dynasty through the eyes of those who were there: leading Iranian revolutionaries; President Jimmy Carter and White House officials; US Ambassador William Sullivan and his staff in the American embassy in Tehran; American families caught up in the drama; even Empress Farah herself, and the rest of the Iranian Imperial family. Intimate and sweeping at once, The Fall of Heaven recreates in stunning detail the dramatic and final days of one of the world's most legendary ruling families, the unseating of which helped set the stage for the current state of the Middle East. Andrew Scott Cooper is the author of The Oil Kings: How the U.S., Iran and Saudi Arabia Changed the Balance of Power in the Middle East, and an adjunct assistant professor at Columbia University. He is a regular commentator on US-Iran relations and the oil markets, and his research has appeared in many news outlets including The New York Times and The Guardian. He holds a PhD in the history of US-Iran relations and lives in New York City.